The CXL 2018 conference is the premier conference for optimization-minded professionals. When it came to selecting a conference to attend, my original criteria was to find something that would primarily benefit my core role: marketing analytics. As my search widened to the dozens of conferences available in the domestic United States, I realized that I needed to be more specific about what I wanted out of a conference. So what matters when selecting a conference? Firstly, it needed to be hosted in the United States, have a focus on marketing analytics, and be in 2018. My Secondary focus was on networking opportunities to meet like-minded marketers. The third focus for me was that the conference came well recommended by marketers. Finally, I wanted speakers from across the spectrum of companies, sizes, and topics. I ended up with a list of five conferences I would love to attend, and I did a write-up for my boss on the value it would provide me and to our company. I figure that if I am allowed to attend, I should be able to prove why attending provides value to me and CallSource. I created this write-up, and I was cleared to attend one conference on my specialty (Marketing Analytics) and one on my other hat (Digital Advertising). Woohoo! So what happened? How did CXL 2018 go? I will break it down by day and highlight some of the most valuable insights I gleaned from the event below. Every event needs a Master of Ceremony or the host to help the event move from speaker to speaker and manage the questions and answers. At CXL the enthusiastic host was Michael Aagaard, and he hands-down made the event flow and added excitement to the early morning. I got to talk to him several times and appreciated that he could turn his introversion (hard to believe for an MC right?) into a masterful conductor of the event. Questions and Answers – How did they pull it off? Conversion XL selected a really fun tool to manage the question and answer portion of the event. They used Sli.do; you ask a question (even anonymously) and the audience “upvotes” the questions they want to be prioritized. Usually, Michael took about 3 to 4 questions at the end of every talk, and those questions could be read by everyone on the big screen. I had more than a few questions that made the stage (ahh yeah). I will occasionally mention that I pulled my notes out of my “Conference Journal.” I went to the store and bought a small notebook where I wrote down names, notes, details, and took down impressions I had while I was at the conference. It became invaluable when writing this article. At first, I jokingly questioned growth needing to be a topic. What marketing team or company does not want to grow? However, I quickly reconsidered this thought, because the most important aspect of growth is growth in a controlled and managed manner. Take the allegory of a farmer; he plants seeds in rows, rotating the crops from plot to plot to ensure that the minerals can return to the earth. The farmer plants in rows and with spacing to ensure that the plants grow without harming each other, making it easier to harvest. Likewise, marketing growth has to be strategic, planned for, and tactical in what it does to achieve it without harming itself in the process. The value I got out of day 1’s growth focus was to strategically plan for growth that is sustainable. I would look around in the conference center of the Hyatt of Lone Pines and see marketers from large companies like Microsoft or Google on one side and then marketing teams of one who work exclusively as consultants. I saw that we all had takeaways for how we could approach sustainable growth. Bryan started the talks with a bang; he is not shy and knows how to talk about the core issues of a topic. I went in thinking… maybe I’ll take a few notes and take it all in; it’s just a keynote. Nope! Bryan had me jotting notes and drawing a flowchart right into my conference journal. Bryan’s talk reminded me of an information systems class I had emphasizing the process of information in an organization. The organization of our company and teams need to be built on a process where we are continually innovating. What really struck me was when Bryan points out that the era of mobile started some 10-years ago and yet some companies are only now acknowledging the mobile market. Did we miss the mobile boat? What’s next? Bryan says the new era we are now entering is the era of “Voice.” Alexa, Siri, Google Voice Search, and more capture the new era of how customers are interacting with brands. I doubted this possibility, but Bryan points out a shocking statistic, “57% have ordered something through voice.” Whoa! Okay, maybe voice is something we should take more seriously. We only need to be faster [at innovation] than our competition. The organization of our company and teams need to be built on a process where we are continually innovating. There is a better model, and Bryan says that model is customer-centric. 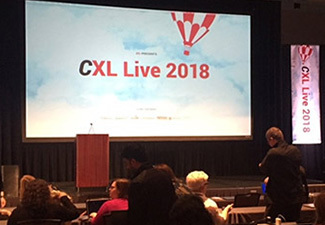 By now the event ended weeks ago, but a survey from CXL went out to the attendees, and Hana’s talk was rated in the top 3 of all talks – pretty impressive. I met Hana in the halls on the final day, and she is definitely a confident and determined marketer. What surprised me when I went up to her was that she wanted to talk about me and was genuinely interested in my company’s situation. I think meeting so many people and presenting takes a lot out of a person, but she didn’t seem burdened at all (at least at day 1). Hana works at Shopify and wanted to scale her organization but wanted to do so without the issue she calls, “Chasing the Firehose.” Hana wanted to help Shopify Plus, the enterprise platform, to scale both in market share and in the scope of their operations, without trying to set and reach some unattainable goal of scale. I was scribbling all over my conference journal because I connected with the struggle of changing long-held traditions in companies. Her quote hit me hard, “Facts do not change minds.” So I sat there… puzzling over the concept – so what does change minds? Challenge #2 – the inputs that guided decision making need to be defined. Who, what, why care, how different, and positioning against alternatives were the questions that needed solid answers. Some companies answer these in general fashion with their mission, vision, and purpose statements, but Hana wanted them ingrained in the organization’s team with solid proof points. Challenge #3 – motivation. “Context is King,” as Hana says. Sales needs to know what marketing is doing and how it aims to help them sell more, save time, and be more efficient at it. This is where Hana mentions that context for sales must be simple and have a clear purpose. Besides needing to be patient, I also wrote down, “Balance the short and long-term impacts.” I feel it’s a life lesson that a little more patience and balance could go a long way for marketing. The inputs that guided decision making need to be defined, with solid proof points. Ed Fry is a charming and friendly guy from across the pond. I first met him in the halls and then again during the loud dancing festivities that night. Somehow Ed remembered me and my name every time I talked to him… who does that? Ed shares the magical tools that allow marketers to do hyper-personalization and they are called Customer Data Platforms (CDPs). I had never heard of a CDP or any tool that could reliably handle the complexity needed. Like all tools, Ed points out that there is no one-size-fits-all solution, and that some companies have faux “CDP” solutions. Step 0 – Get in a room together and try to be there in person. Step 1 – Define a solid Ideal Customer Profile (ICP). Step 2 – Map the entire customer journey into lifecycle stages. Step 3 – You need to rely on tools; but find tools that do a good job at enrichment, tracking, attribution, and audience syndication because those are ideal for tools to do. Step 4 – Unify personal data across your database so that you are looking at data tied to customers. Huh? How!? Sorry… but you need a tool for this, and they are called CDPs. Step 5 – Orchestrate. Discuss the actions, next steps as a team, and how feedback will work. Orchestration is the application of everything into hyper-personalization. Ed brings up a point that I hadn’t thought much about but makes a lot of sense – who should be responsible for all of this? Though this quote is paraphrased a bit, it struck me again – another mention of corporate structure needing to change their perspective and the need for patience. Ed was grounded in trying to help everyone at the conference, even if he represents a company (Hull) that makes a B2B CDP. Ed had a slide that showed his picks for the better CDP’s and they included his competitors who do certain things better than they do it like e-commerce, mobile, and enterprise-focused solutions. If unifying customer data is your problem, consider investigating Customer Data Platforms. 1 to 1 marketing is a data problem, not a marketing problem. There are no one size fits all [CDP] solutions yet. The best success is when the effort [to orchestrate the data] is led by marketing. I had just come back from a break and was making my way around the rows and tables of chairs in the conference center when I saw a face I recognized. He had longer hair in a bun – something about his face seemed familiar, and he was grabbing a drink of water in the back… so I thought I’d just say hi. I think he saw me coming because he turned towards me and prepared his hands to say hello. He also looked at me in a, “You know me, and I don’t know you,” sort of way. As I was a few steps from him, I remembered – that’s Ezra Firestone! He led a course I had taken on e-commerce put together by Digital Marketer. I said hi, we shook hands, and then he said he was preparing himself to speak. I forgot he was even on the agenda (rookie attendee mistake). I told him he was awesome and that I enjoyed his courses and headed back to my seat. He was in another place – focused on what he wanted to convey for his talk, and I thought it was cool to meet someone I recognized. Ezra breaks down his CXL talk into two main sections: Email, and the future of the medium which he calls conversational marketing. Jumping head-first into an email, Ezra shows in-depth what he is doing with emails, headlines, body texts, and call to actions. Trust Builders – social proof, testimonials, behind the scenes, etc. Content Emails – tips, education, information, personal ideas, comedy, and relevance focused. Offer or Sell Emails – sales based, announcements, coupons, promotions, etc. The more important takeaway for marketers today was his emphasis on the era of conversational marketing. Just like Bryan Eisenberg noted that voice search is the new technological innovation that marketers should pay attention to – Ezra suggests we all need to take a hard look at messenger marketing. Messenger marketing (and I saw this acknowledging that Ezra has ownership in a messenger platform) is about having conversations with your customers. Messenger marketing primarily takes place through Facebook messenger and utilizes messenger bots. The bots are not what you think – they are simply predetermined questions that are asked automatically and allow for the recipient to respond by clicking or typing. Wow, that’s pretty good. Ezra points out that he is using messenger at a targeted placement along his funnel and it’s skyrocketing his results. The final marketing tip I’ll share from Ezra’s talk was that it’s important to reiterate the mission, vision, and purpose in the footer of the email to discourage un-subscription… why? Because it works! Ezra has found success in optimizing the layout of every single email (where everything has to go and why). Every email [should] fit into an email category that cross-links to one another. We all need to take a hard look at messenger marketing. Emails are still the primary communication channel for businesses and marketers across most industries… for now. Alexa Hubley hails from our neighbor in the north and works for Unbounce. I am a fan of Unbounce, and I had some questions about their platform, so that’s what I went to when we crossed paths in the conference hall. I had only a few minutes before Ezra went on stage, so we briefly talked, she answered my questions, and Alexa apologized that she needed to run but suggested we connect in the hall after. In her CXL talk, Alexa weaves together a very clever metaphor of applying the process of relationships to customer marketing. I’ve heard Ryan Deiss make a similar metaphor, but this one was relating it to movies. I laughed and enjoyed the jokes and puns that she included throughout her talk and found relationships to be a very relevant metaphor for marketing. Alexa points out that we can learn from relationships and use that to our advantage: to add intimacy, to woo our customers, and to build trust. Alexa applied her model to the pricing shift campaign that Unbounce went through turning her talk into a case study. Alexa envisioned that her takeaways would help with retention, advocacy, engagement, and help turn customers into evangelists. So what can we learn from romantic comedies? Intimacy (Love Actually) is all about getting closer and segmenting our audiences the right way so we can talk to them as ‘intimately’ as possible. Woo (Kumail* might have this wrong) is about building an emotional connection with our customer. Alexa suggests that if it fits your brand, try humor. Trust (Bridget Jones’s Diary) starts out with the assumption that our customer may not believe us when we talk to them so reciprocity is key… we have to give to get. I wholeheartedly agree with this mentality. Get closer to your customer and segment your audiences the right way so we can talk to them as ‘intimately’ as possible. Building an emotional connection with our customer. The marketing analyst in me wants you to pay attention because retention is probably the single most important thing in all of marketing and from my brief experiences it’s the easiest to ignore. I waited until the talks of the day were done before I approached Tara because her talk gave me so much to consider and I had a lot to ask her. I knew retention, I had my own cohorts, and I have my own version of lifetime value, and yet Tara managed to humble me and point me in the right direction. I walked over to her group with several pointed questions and by the time we started talking I had forgotten them, but I’m glad I did. When I couldn’t remember the question I needed to ask I decided to ask her some personal questions about her passion for marketing, for data, and why she does what she does. Tara seemed refreshed to talk about something different as we dove into the “why” which was enlightening to me. As marketers, I think we should probably consider why we are doing what we are doing and if it’s our passion… even if we aren’t CMO’s or making millions. For Tara, who literally lights up around data, you could tell before she answered that she has a passion for growth marketing. Lost perceived value by the customer. Environmental loss (most often you can’t do anything about this). Long Term – the long-term outlook of when a customer uses the product as they grow, scale, or possibly fall. Tara calls this, “Indispensable,” and uses that word to suggest this is where massive value has to be perceived. Tara gets statistical here and points out that there might be correlative patterns that result in healthy acquisition and retention of accounts. She breaks it down that these patterns can be quantitative and qualitative (probably always should be both for decision making). Quantitative patterns to consider include the straight metrics of users, logins, the number of sources, revenue amounts, counting the number of touches, and then the typical retention metrics. The qualitative patterns include (and if you don’t have these consider getting them): customer surveys, voice of customer feedback, and deep interviews. There are two main reasons for customer churn. Finding patterns in data is a total waste of time if you do nothing to change based on what you learn. Retention is critical and that we must understand the customer drop off points if we truly want to grow. I enjoyed Bangaly Kaba’s talk, and I got the impression that there is a lot more to him than what I witnessed. Bangaly is a brilliant guy; he took questions in stride and communicated his message in a way that made me want to start optimizing right away. Bangaly was also a ghost because I tried to find him afterward but could not. He answered one of my testing questions about whether testing should be small and iterative or “cannonball” as I have experienced, and he suggested that I try to avoid “cannonball.” He chuckled a bit when he read the wording of my question. Focus on the marginal user and remove the barriers to usage, reduce friction, and look for challenges outside of the platform such as in locations, devices, or internet access. Making an impact requires that we “understand work” and can identify the difference between work and success – so we have to learn to prioritize. Testing is about iterating towards a vision. Bangaly shared that his team knows what stage they want to get to next and when there might be diminishing returns on achieving it. Zoom out, solve the larger problems first. Bangaly shared that his team found out about an error that was making it difficult to log in and called this (access churn). Focus on the impact you are trying to make. The long-term waves you want to make are the goal, not just the launch. Reduce friction for your customers who want to buy. Learn to prioritize testing and optimization. Testing is about iterating towards a vision. Solve for the larger problems first. Everything in marketing starts with retention.